Drunkin’ Weenies are basically little weenies that are drunk. (I’ve personally known a few drunkin’ weenies!) All kidding aside, drunkin’ weenies are lil’ cocktail weenies simmered in a sauce made up of barbecue sauce and brandy. A lot of brandy I might add. 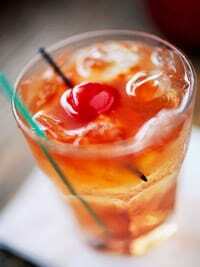 Here in Wisconsin, we love our Brandy Old Fashions. Somewhere along the line, some brandy was added to the lil’ weenie sauce. Oh, what a shame! If you are from Wisconsin, you are familiar with a Brandy Old-Fashion. You are probably familiar with a few drunkin’ weenies too. There are a handful of cocktails that to me scream my youth; Brandy Old Fashions, Brandy Slush, Harvey Wallbanger, Black Russian, Alabama Slammer, Pink Squirrel and Sloe Screw. I have drank my fair share of all of the above and then some. Today’s recipes use Brandy, a Wisconsin favorite. Here in Wisconsin we love a good ol’ Brandy Old-Fashioned. It’s a drink that our Grandparents drank and our parents drink. It will most likely be your first drink, when you become of legal drinking age. A Brandy Old-Fashioned will be the first drink your grand-parents or parents order for you at their favorite supper club. It’s a tradition here in Wisconsin, your rite of passage into adulthood. Brandy Old-Fashioned was the first alcoholic drink I ever drank. On my 18th birthday, my family took me out to dinner at Jacks or Better. A very popular Supper Club back in the day. It was located in the small city of Little Chute WI., the city my Grandma Rose hailed from. My Grandma Rose ordered my first Brandy Old Fashioned Sweet. It came in a ‘bucket’ style glass, with a rock candy stir stick, a slice of orange and a cherry. It was delicious and strong! My Grandma also ordered my first appetizer that same evening. Grandma Rose ordered me my first ‘Shrimp Cocktail.’ It came in a huge cocktail glass, that was served right at the bar. It was served ice cold, a sauce was poured in the middle of the glass and the large shrimp hung over the side. That night my Grandma Rose also taught me the fine art of ‘Bellying-up to the Bar.’ I practice I was actually quite good at, at one time. After dinner I had my first ‘after dinner drink’ which was a Black Russian. made with the owners ‘secret ingredient.’ Harvey Wallbanger is the perfect name for this very tasty drink….because it packs a punch! “Jim’s Place” was either at the beginning or at the end of the famous “Death March” This depended on where you started the “Death March” The “Death March” was a march you did on your 18th Birthday…this was during the time when the legal drinking age was 18 in WI. The lucky or not so luck birthday boy or girl marched up one side of College Ave then crossed the street and proceeded to march down the other side of the street. The lucky or not so lucky birthday boy or girl went into every tavern located on College Ave and had a “shot” or “drink” at each establishment. At that time, there were many, many taverns located in downtown Appleton. Plus the fact that College Ave is at least 20 blocks long, this was definitely a feat. We are talking about a drink or shot at each place. The beverages were usually on the ‘house’ for the lucky or unlucky birthday boy or girl. In a large crock pot mix together; barbecue sauce, ketchup, brown sugar, molasses, liquid smoke, hot sauce and brandy. Add little weenies or smokies. Cook on high 3 to 4 hours. Turn to low to keep warm. Place tea bags in a small bowl. Bring 2 cups water to a boil, pour over tea bags, let seep for 5 to 8 minutes, discard tea bags. In a large bowl mix; lemonade, limeade and orange juice concentrate with water. Add apricot brandy and mix together, add tea, stir. Pour mixture into an empty and clean 5 quart ice cream pail, freeze. When ready to serve: Fill a tall glass 3/4 full with slush mixture (Scoop slush out with an ice cream scoop) Add lemon-lime soda or 50/50 to slush in the glass, stir and serve. In an old-fashioned glass, add one sugar cube, add 2-3 dashes of bitters. Let sugar soak in the bitters for a few minutes. Add 2 maraschino cherries and one thin slice of orange, muddle together. Add ice cubes, 2 oz Brandy and 7-up. Stir. Garnish with an orange slice, maraschino cherry and rock candy stir stick. To find out more about the Brandy Old-Fashioned. Another Wisconsin tradition, is the Wisconsin Friday Night Fish Fry. A Brandy Old-Fashioned and a Friday Night Fish Fry……The two just go together.